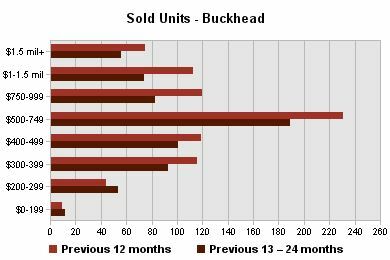 The graph depicts the state of the Buckhead real estate market as sales during the past 12 months in most price ranges have outpaced sales during the previous 12-month period. In case you had any doubt that now is the right time to sell or buy because of low inventories and cheap money, the numbers say it all! These numbers are mirrored in Vinings, Sandy Springs and Broohaven as well as other close-in popular areas. Let me know if you would like a snapshot of where your house fits into the market, lesa.bell@harrynorman.com.